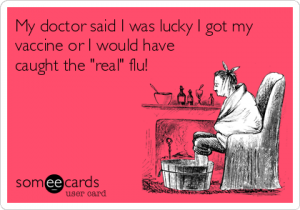 I know that most of you know how outright ridiculous, even dangerous, the flu vaccine is. I am taking the time to write to you, now, for two reasons. The first is that, despite what you know, some folks (I’m not saying you) may be coerced or bamboozled into offering up your arm in a weak moment, like at the MD’s office. “It’s good for you. This biologically questionable material, combined with various neurotoxins has been approved by the FDA, and the CDC recommends it.” Don’t fall for it! You know what you know! Second reason: You have friends and family who DON’T KNOW what YOU know. So, they will do what everyone else does. The Doctor will tell them. Everyone else but you will tell them. They go into CVS or Rite-Aid or Walgreen’s, and they’ll be bombarded with maybe 50 signs… “SHIELD YOURSELF FROM THE FLU.” What nonsense! But, obviously, it works… the propaganda, NOT the shot. So, the bottom line is, if you don’t tell them how bad the flu shot is, they will get it. If they have kids at home, they’ll bring their kids to the pediatrician to get the shot. (In this category, there have been some deaths reported.) Follow my Facebook Page, and you’ll keep up with all the gruesome but necessary news. Also, talking to a friend or family member about the uselessness and dangers of the flu shot might serve as a way to begin the discussion about Innate Intelligence, and their need for chiropractic care. You see, they have been sold on the flu shot, and every other shot, because they have been told that they have nothing inside to protect them, and that they need to “holy water” of Medicine for any protection. It’s classic Outside-in allopathic (medical) philosophy. The very erroneous core belief is that you get well from stuff from outside your body, from drugs-in, from surgery-in. The Truth? You get well from Above-down, Inside-out. A drug can suppress a symptom. Surgery can cut out a part, but only YOU, your own Innate Intelligence, have the capacity to heal. This includes the actions, the functions, or lack thereof, of your immune system. It does not exist on its own. It does what it is told by your Innate Intelligence, via your brain and nervous system. If there is interference, your immune system may not function properly. Correct the interference with gentle, specific, scientific chiropractic adjustments, and your immune system will be able to function better. THIS INCLUDES PREVENTING THE FLU, and/or any other infectious diseases. Worried about the flu? Take care of yourself. Avoid poisons (like the flu vaccine), eat well, rest adequately, exercise regularly, and, above all, keep your nervous system clear with regular, wellness chiropractic care.